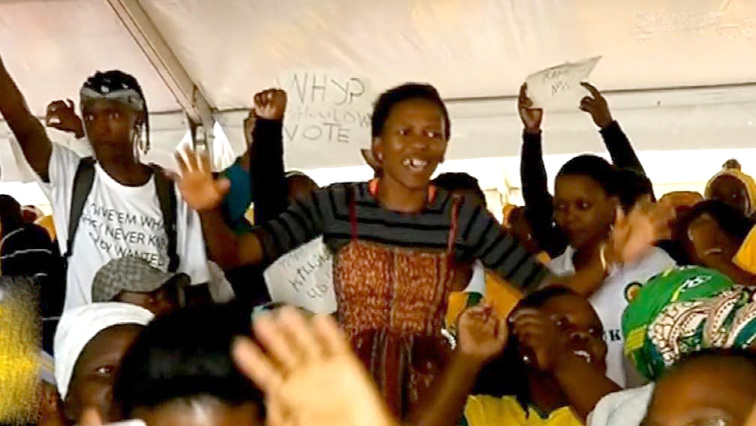 Disgruntled ANC members disrupt launch of E Cape manifesto - SABC News - Breaking news, special reports, world, business, sport coverage of all South African current events. Africa's news leader. ANC in the Eastern Cape says people have to be allowed to raise their grievances. The African National Congress (ANC) leadership has vowed to address the concerns raised by that some disgruntled party members who stormed the venue of the launch of the Eastern Cape election manifesto at Badibanise stadium in KwaBhaca formerly known as Mount Frere on Saturday. Irate ANC members disrupted the programme in protest of poor service delivery in their area, but ANC leaders intervened and restored order. The disgruntled members stormed the venue and disrupted the proceedings, just as the ANC Treasurer General was addressing the ANC members about the party’s manifesto. They were singing revolutionary songs demanding better services to the community of KwaBhaca. ANC Treasurer General Paul Mashatile says the manifesto has answers to some of their concerns. Mashatile continued with his speech calling on ANC members to campaign and canvas for the ruling party. Speaking in the same event, South African Communist Party Provincial Secretary Xolile Nqata says they have reversed their decision to contest the elections alone as they want to ensure an alliance victory at the polls. Some senior party members tried to obstruct journalists from capturing the protesting members. ANC provincial chairperson Oscar Mabuyane has condemned the protesting members describing the protest as uncalled for and a sign of ill-discipline. “I wish to assure the media and South Africans at large my unreserved commitment to media freedom. I sincerely regret the incident,” reads the statement. The South African Communist Party (SACP) has described as unfortunate, reports that the Communications Minister attempted to stop the SABC from filming a protest in the Eastern Cape earlier today. The SACP’s Alex Mashilo says they will discussing the matter with the alliance partners as well as the Minister. This entry was posted on 09 Feb 2019,07:08PM at 7:08 PM and is filed under Politics. You can follow any responses to this entry through the RSS 2.0 feed. Both comments and pings are currently closed.